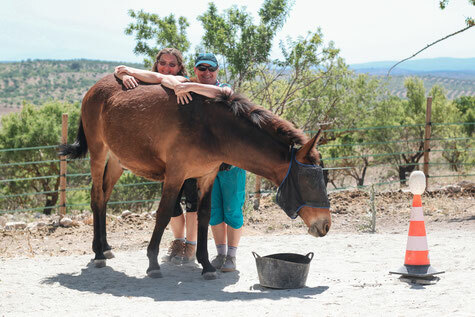 Welcome to Positive Horse Training Spain. We are an equine rehabilitation centre, where we train using positive reinforcement. In other words, we wave carrots, not sticks! We run courses to teach horse owners Positive Reinforcement Training and Rehab Techniques. All our horses have suffered neglect, food deprivation, physical and mental abuse in their early lives before wonderful people stepped in to rescue them. The rescuers were either individual people or A.R.C.H Rescue Centre near Malaga. Towards the end of 2016, when the project first started to take shape, we spread the word that we would be looking for horses who had been rescued and were now ready for the next part of their journey. The horses arrived over a period of months from various places around Malaga and Granada provinces. They had all been loved, cared for and given good diets to help them become healthier horses after their initial rescue. We knew from their case histories that some had been ridden. For example, Selena came to us wearing a headcollar. Of course we took it off in the field, but we soon saw why she had worn it all the time. As soon as we appeared with the headcollar the next day, she ran away from us. In the past being caught and haltered meant that something unpleasant and aversive was going to happen, so she avoided it. Our approach was to befriend her without trying to catch her. We taught her to follow a target at liberty instead, so she knew she had the choice to come with us or leave. After a couple of months, when she was happy to be with us and enjoyed her training, we started re-training her for headcollars. But we used a nice soft scarf instead. Soon, she loved having her headcollar, fly-mask and anything else on her head, as it was now a fun game to her. Headcollars now predicted that good things were about to happen. You can see the video of how we trained it here. By listening to their voices and respecting their needs, the pace of rehabilitation has been dictated by the horses. Taking the time it takes to unpack their fears and deep anxiety has taken much longer than we expected. We love that we have set up our Rehabilitation Centre like this, but it does mean that it has been much more expensive than we predicted. We are not going to change the way we do things because of money, so we have decided to set up the horse centre as a Not For Profit Organisation. We have started the process of registering formally in accordance with our accountant’s advice. 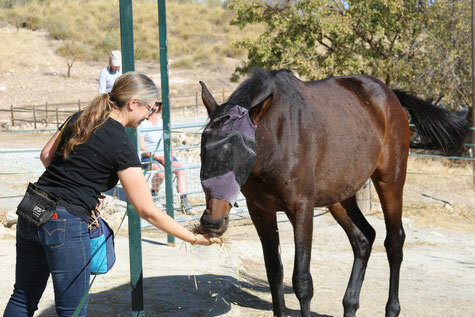 Support us by giving a monthly donation to help care for the horses.